NOW & THEN. Picture yourself is a workshop, aimed at pre-teen girls from the Ard el Lewa district of Cairo, where the project was conducted in November and December 2011, thanks to an artists exchange grant for the social context intervention, including the art centres CAN at Farrera and Artellewa in Cairo. During the workshops, of a playful and creative character, participants Amira Taha, Fatma Hisham, Ganna Hamada, Hadeer Salah, Malak Hamada, Rawda Ezz and Yara Sayed, using drawing, photography, performance and sculpture, explored their present and their hopes for the future, taking into consideration their own social context. The workshop created a space for dialogue where listening was as important as talking. Under the premise of creating rag dolls which represented the participants as self-imagined professionally in the future, the girls learned to develop critical attitudes and subjective positions, to decide the look of the dolls, which eventually they took as their own. The development of theatrical scripts where the dolls acted as if the girls were already adults, allowed them to explore and to take positions about their imagined daily routine in areas beyond professional and family life and free time. 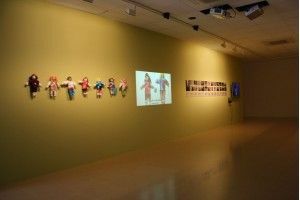 To conclude the workshop there was an exhibition of the dolls and a video made by the girls. The exhibition format allowed the girls to tell their parents and the neighbourhood their dreams, reaffirming their attitudes and their positions by making them public. Wissam Selim collaborated in the workshop.